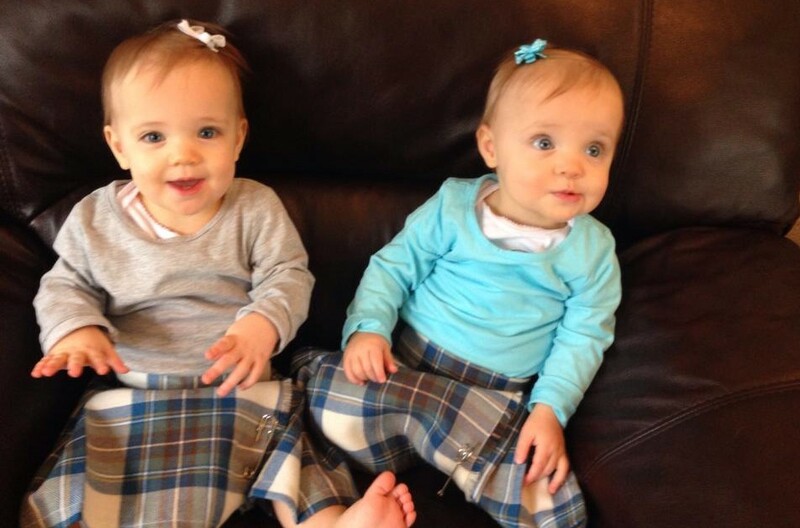 Our twin girls just turned one. I am not sure if we should jump for joy or collapse on the couch. We’ve become masters of “your turn” middle of the night baby handoffs. Tired is no longer a temporary condition, but something you live with like your right arm. I am not a whiner, but I wish I counted how many times I’ve picked up and redirected two babies speed crawling opposite directions toward outlets, cat food, and the fireplace. My lower back knows. And, BTW, two new tiny people live in our house. OMG. No pressure! We are only responsible for how they turn out. My water broke at 6 a.m. January 11, 2013 and I said, “Uh, Reed, we have a problem.” He jumped out of bed thinking something happened to our old cat. 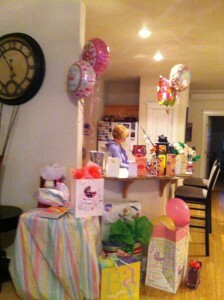 My baby shower was the next day. Oops. I felt compelled to shower and put make up on after my water broke. As we dashed around grabbing things for the hospital, I told Reed to grab the car seats. At 33 weeks to the day, he knew we wouldn’t need the car seats anytime soon. He also knew he didn’t want to have that conversation with his wife in labor. Pre-epidural felt like some kind of hell. Post-epidural felt like a day at a very cold spa. 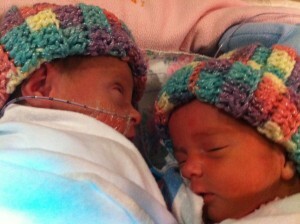 January 11, 2013, late Friday afternoon, we welcomed Sydney at 4:43 p.m. and Riley at 5:07 p.m. Each weighed four pounds. 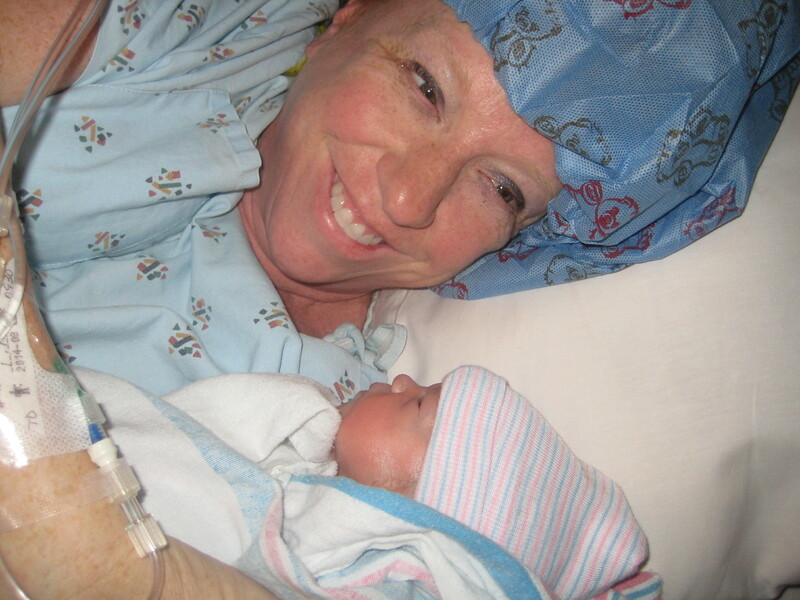 Two days later, discharge day from the hospital for me, I returned home no longer pregnant and with empty arms. It felt like the worst kind of emptiness. Sara, my sister, made the transition home easier by using her key to fill our house with baby shower gifts, cards, balloons, homemade veggie soup and bread, and champagne on ice. My mom planned to live with us for three months to help out with the girls. The pre-scheduled day of her flight? The day the girls were born! Thank you universe. The first three weeks I learned terms and things I didn’t want to know … baby bilirubin levels, apnea episodes, feeding tubes, wires, beeping monitors, caffeine in IV and isolettes. 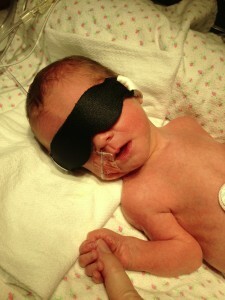 Every morning and evening, weaving our way through a large NICU, we saw couples huddled around teensy babies. Some were praying and hoping their babies make it. 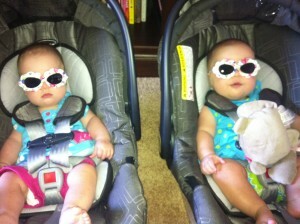 Doctors told us it was just about “feeding and growing” for Sydney and Riley. We never forgot to be grateful. My appetite was so ravenous from being a human milk factory that I was disappointed when we no longer lived at the hospital with the daily access to a buffet of food–from pizza to sushi. 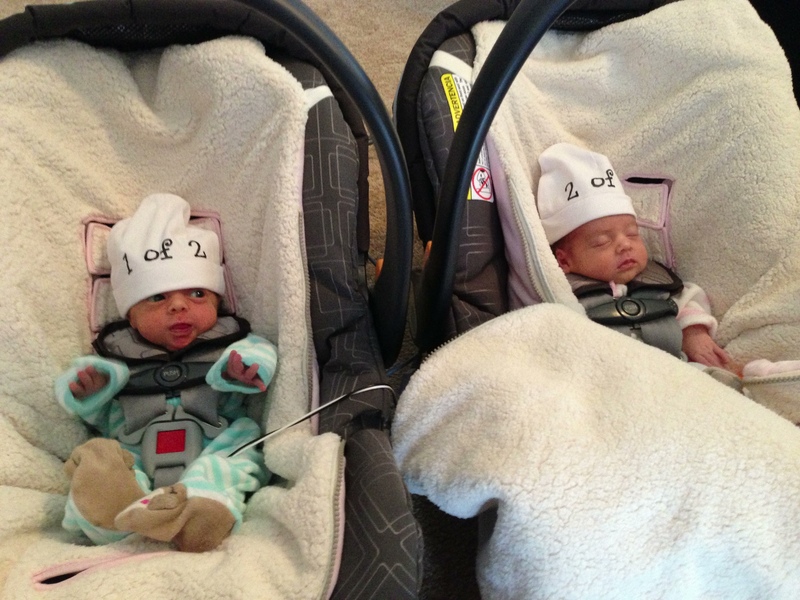 As preemies, the girls had to pass a car seat test in order to be discharged home. 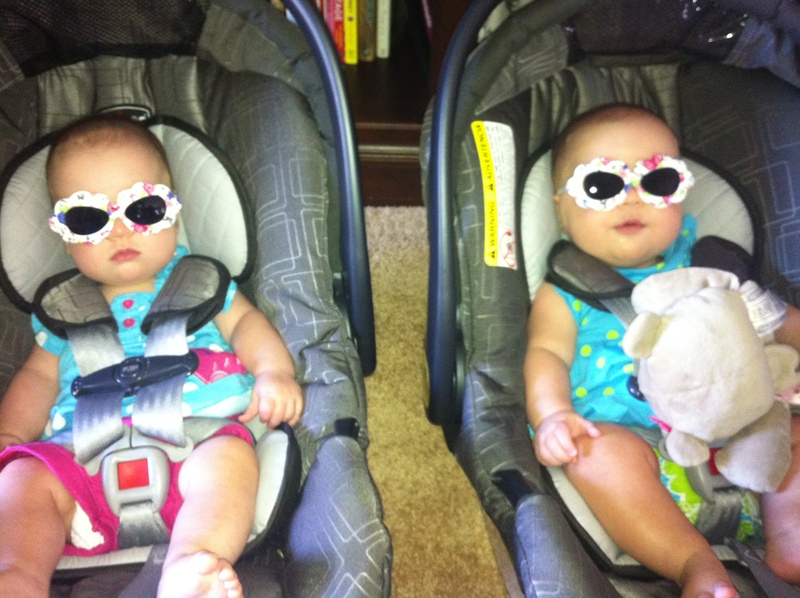 It was scary to see how tiny they were in their car seats. 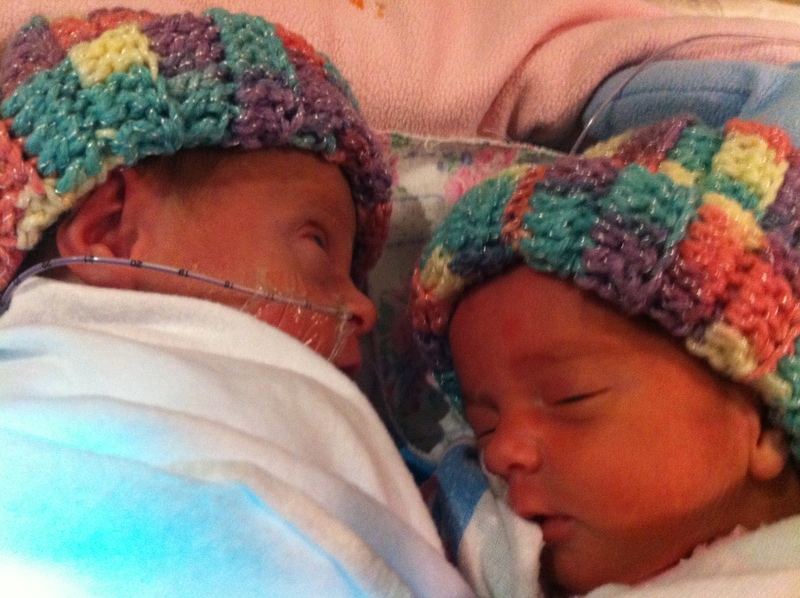 On February 2, 2013 the girls came home, both on apnea monitors. We all took turns doing middle of the night feedings, Reed, my mom, me. We all were so sleep deprived my mom put on her glasses in the middle of the night only to discover they were her sunglasses. Another time, Reed told my mom to wake him up in ten minutes when the bottles were warm so he could help. Reed woke up three hours later and asked my mom if the bottles were ready. We are forever grateful to my mom for those first not-so-easy months. Who volunteers to wake up at all hours of the night to help with crying babies on a three-month leave of absence from work? My mom! With my hormones pinging off the walls post-birth, and with little sleep, I had a few moments wondering if I ruined our fun lives. Smiley Riley dances on her own, has radar for where her daddy is in the house and loves snuggles and cuddles. She is the messiest eater, putting baby food in her hair. Sydney is so chill, except when she is shrieking because Riley took one of her toys. She loves to figure toys out and is so ticklish. She is so gentle petting the cat. I love Reed’s face as the he holds or plays with the girls. I love it when the girls make each other giggle. Waking up in the morning to two girls who smile ear-to-ear and dance side-to-side in their cribs has to be one of the best ways to start the day ever. Having the most kind and loving friend/nanny/neighbor to watch the girls at our home while we work is something we are thankful for daily. Wake up every day happy. Get ready for unsolicited input. Read baby books before you give birth. You won’t have time after. A nap can solve a lot. Never again will you take silence for granted. 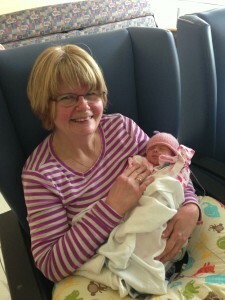 Strangers are friendlier when babies are present. Never will you be more motivated to be your best self and live your best life so you can be the best example for your children. Nothing matters as much as family. And lastly, it isn’t double the trouble, it’s double the blessings.